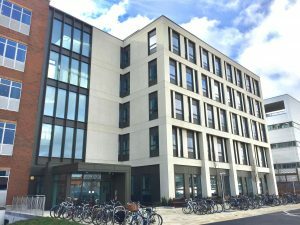 Funded by a Strategic Award from the Wellcome Trust, we have recently built new state-of-the-art Clinical Research Facilities dedicated to research in Metabolic Disease. Our vision is that the IMS Translational Research Facilities (WT-MRC IMS TRF) will allow us to build on our major strengths in experimental medicine as applied to the study of obesity, insulin resistance, type 2 diabetes, lipodystrophy and thyroid disorders where we currently run multiple experimental medicine studies, clinical interventions and trials. We have active interactions between IMS PIs and Industry and act as a hub for the training of the next generation of Clinician Scientists working in Metabolic Disease. Our aim is to enable and support new translational research led by PIs whose predominant focus is basic science, with developing programmes in nutrient sensing and fatty liver disease. The TRF is located immediately adjacent to the IMS and is connected to the existing Wellcome Trust-NIHR Clinical Research Facility (CRF). It houses an 8-bedded unit for complex high intensity metabolic studies and a “non-clinical” environment to support studies into the cognitive neuroscience of eating behaviour. The Facilities are customised for clinical studies in patients with severe obesity, include design features that enable studies of temperature regulation and circadian rhythm and house a large diet kitchen capable of preparing bespoke meals for long-term studies. We have access to two chamber calorimeters and portable indirect calorimetry, a body composition suite and exercise equipment in the adjacent CRF, as well as Magnetic Resonance Spectroscopy, 3T and 7T research MRI scanners.